If you follow Makeup Savvy then you will know I'm keen on an eBay bargain every now and again. Who am I kidding? I seem to order some irresistible budget find most days! But recently I've fallen out of the loop of sharing my eBay finds so to ease my way back into another year of eBay Bargain blog posts I thought I would share the cream of the crop when it comes to what's on my eBay watch list right now! 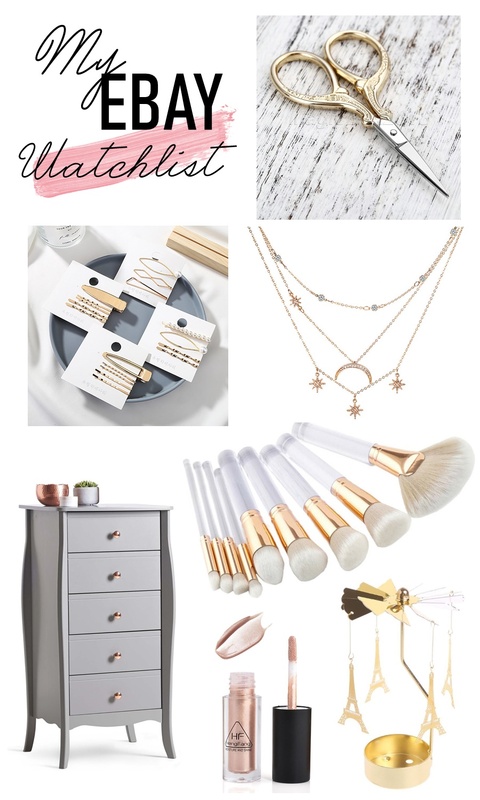 Much like most people's eBay watch list, I have a mix of items so below you will find an edited version, from makeup to homeware and a few accessories, I will no doubt add to my basket sooner or later. eBay is without a doubt awash with fake makeup, however, if you know what you are looking for it can also be a haven of bargain beauty finds from reliable power sellers and stores. A budget makeup brand found of eBay is Heng Fang; a China-based company that's been around since 1995. You can find all their products here however the product I currently have my eye on is this extremely cheap liquid highlighter that comes in 3 shades. All shades look super lovely but I think I will be picking up the rose gold shade to try out. I love bargain finds like this! Over the past few years I've bought more makeup brush sets from eBay than I care to realise! Since buying my first ever budget set from eBay I realised how there wasn't a need to pick up high end or even high street sets ever again. Actually, that's a lie... I still love Morphe and Real Techniques brushes but I'm done with all other makeup brush brands! Of course there are a few dodgy brushes sets to be found on eBay, but generally, from the stock images, you can see the cut of the bristles and what you are buying. Which is why I have this stunning-looking set of brushes currently on my watch list. With both face and eye brushes this is a really varied set and I simply can't get over how pretty the clear acrylic handles with the gold ferrules are! I know I'm very likely to cave and buy these even though I have more than enough makeup brushes - oops! As I'm not one for wearing special pieces of jewellery on a day-to-day basis I have found eBay to be a great place for picking up cheap costume type jewellery. Still, to this day this dainty Alex Monroe-inspired bee necklace is one of my favourite piece of jewellery I've ever bought and it cost me 99p!! The above necklace is perfect if you love anything with moons or stars like I do, and for the super low price it looks detailed and pretty. This will be mine when I next have a bargain 'spree' and order lots of £1-2 items in one sitting. Just before Christmas I picked this trio of gorgeous Anthropologie-inspired Moon & Star hairpins for only £2.69 and was simply blown away at the quality for such a low price tag. Since I've had my eye on a few more hair pin sets as I like to add something to a hairstyle in this way. The above listing contains 8 different styles of hair clips from geometric shapes to minimalist and pearl designs, all really lovely for only £1! A large part of my eBay watch list right now consists of budget homeware finds, especially storage, as I'm moving house soon and in desperate need of more furniture. This gorgeous looking set of drawers found it's way onto my watch list as I love the style, colour and of course the price. As it will be to store makeup in I'm also considering some Ikea Alex drawers but I'm currently undecided! Another homeware item I'm currently watching are these simple rope hung shelves. These would be great for any corner of the home adding a bit of interest and style. Perfect for styling with a stack of books or a hanging plant! If like me you're candle crazy then you may just want to check out this listing of beautiful candle carousels. These intricate yet inexpensive decorative accessories not only look lovely as they rotate from the heat of the tealight flame but also spin on their own when placed near a radiator making a lovely feature in the winter months especially. These make a great gift but also look lovely on a desk or shelf, even working as a pretty blog photography prop. There are also 20 different designs to choose from! Lastly, a cute little find that again would make a nice treat to yourself while also working as a blog prop or gift. A few years ago I picked up these lovely but super cheap vintage style stork scissors which you may have seen in my past blog images and while they look lovely as a prop I also use them for opening parcels so they were such a good eBay find for me. Now while I don't need another pair per se I can't help but want to pick these up as well! Perfect if you want an extra blog prop or if you are into crafts. Hope you have found a few bargains here or items to add to your own watch list. Let me know if you have any theme suggestions for upcoming eBay posts in 2019!